My hubby and I will be married for 15 years in October. When we were dating I wore gold jewelry, so naturally I received a gold engagement ring. We also choose gold wedding bands, makes sense, right? A few years later I switched to silver jewelry and stopped wearing my gold wedding band and engagement ring. I felt bad not wearing them, but I really didn’t like them anymore. I told my husband that for our 10 year anniversary I wanted new wedding bands and wanted to switch my diamond to white gold. So I started shopping…. There are so many places to look and so many designer engagement rings out there! At Since1910.com you pick and choose everything you want. One stone, two stones, really there is a lot to choose from. So while I did check out Since1910.com engagement rings, we ultimately got ours at the local mall. I had to wait for another two years until I finally got them, but it was worth it! I got my diamond switched to white gold and picked out an anniversary band to wear as my wedding band. 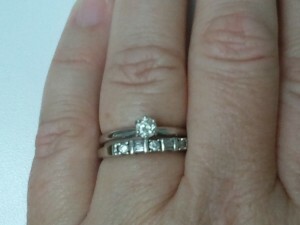 My hubby also picked out a new band in white gold. He still likes yellow gold, but he really likes his new band and now we both wear them proudly! So what can I get this year? 15 years is a long time right? Lol. Good for you, Im also a silver girl. But this is a good thing! When I got married, it was yellow gold too. If I ever get married again, I’ll do platinum or white gold, because I’m a silver person! I would love to have a ring that’s more my style, something subtle yet classic! We have gold wedding bands also. I think i will be looking into white gold or plantinum for our next anniversary. It’s time for an upgrade.